You can follow the instructions on our site that shows the options you can use when obtaining your custom measurements by clicking on the image below. You also have the option in your account at checkout to define what kind of cut (taper) you want on your shirts, information on tapering options is listed below. If a taper is not selected we will use a Regular Cut. An "off the rack" dress shirt usually comes with a one inch taper. Another option is telling us your "Body Type" which will allow us to cut a shirt more custom fit to your frame. Details and diagrams on Body Types are provided below. Your standard dress shirt size can usually be found on the collar or inside panel side of an "off the rack" shirt. 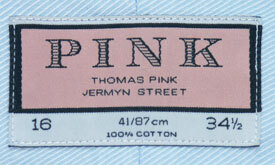 The number shown is your retail Neck/Sleeve size (e.g. 18/36). At checkout, you will find a box to enter your standard dress shirt size and your Height/Weight. You can enter other measurements if you wish but it is not necessary. You can also elect a dress shirt taper (see below for more information). 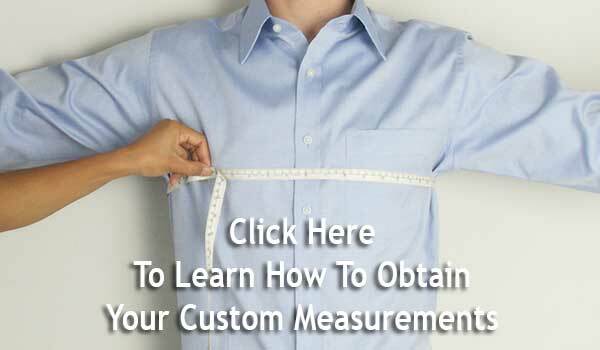 Follow the instructions on our site (see link above) for taking your custom measurements, or measuring your best fitting dress shirt. At checkout, enter all your specific custom measurements and indicate whether you measured yourself, measured a shirt, or had a tailor measure you. Please remember to enter your correct Height and Weight. 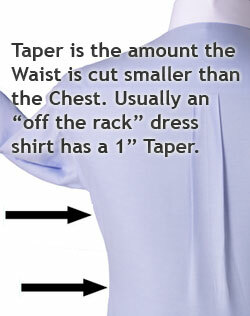 A shirt "taper" or "cut" is how much the Waist is narrower than the Chest. The default cut will be Regular where the Waist is tapered in 1-2" from the Chest. An Athletic or Extreme taper will bring the Waist in even more than a Regular cut. An "off the rack" shirt usually comes with a Regular taper. Athletic fit dress shirts or fitted dress shirts come with an Athletic taper. You will also have the option of defining your body type, this in conjunction with your Height/Weight will give us a better idea of how to cut your custom shirts. If you are not certain of your Body Type, just leave it blank. Thin: A Thin body type would also be called "lean". It is where there is not a large difference in the width of the shirt at the Chest versus the Waist and Hips. Dress shirts with this taper are sometimes called slim fit. Average: An Average body type would also be called "Regular" or "Typical". It is where there is an average difference in the width of the shirt at the Chest versus the Waist and Hips. This is the taper found on a standard dress shirt. Athletic: An Athletic body type would also be called "Fit". It is where there is a noticeable difference in the width of the shirt at the Chest versus the Waist and Hips. The Chest is considerably larger than the Waist and Hips. This is commonly called "athletic fit". Extreme: An Extreme body type would also be called "Body Builder". It is where there is a very noticeable difference in the width of the shirt at the Chest versus the Waist and Hips. The Chest is considerably larger than the Waist and Hips, the Waist is usually quite small in comparison. Husky: A Husky body type would also be called "Large" or "Heavy" or maybe even "Beer Belly". It is where the Waist is noticeably larger than the Chest. Sometimes the Waist is a half dozen inches bigger than the Chest and sometimes the Waist is over a foot larger than the Chest. Other Information: If there is any additional information that you think we need to tailor your dress shirts, please feel free to enter that in the special instructions section of your account. Incomplete Measurements: If you are not certain of a measurement, just put in the information that you have. We have a database based on thousands of shirts that we have tailored and we reference this against every order checking for any anomalies. Even with partial measurements and your correct Height & Weight we can usually decide the correct sizes. If we have any questions we will contact you before we tailor your shirts.